Aloha! We’re currently offering a free download for anyone who adds/Likes us at our Mountain Apple Company Facebook page! After you’ve added/Liked us, just go to this link for a free download of IZ’s “White Sandy Beach”. And you can also check out our previous free downloads as well, from Robert Cazimero, Kaumakaiwa, Kuana Torres Kahele, Mailani and Raiatea Helm! There are 3 comments on Free Download! I am at a loss for the words of how your voice and your words touched my soul and lifted me from stressed and dark place and carried me to a place of joy. I have been deeply touched by your art and am grateful for you. I will be purchasing your music, listening daily and sharing with everyone. I do hope that one day our spirits will meet and I will be able to give you something back equal or greater than what you have given me, my family and friends. 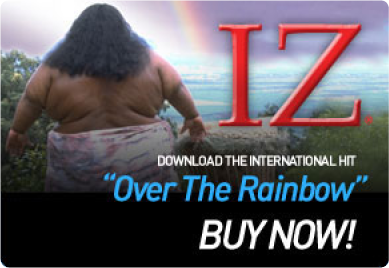 Was introduced to Iz when my wife and I went to Kauai for our 30th wedding anniversary. At once, he touched my soul and have been a fan ever since. I listen to his songs every morning before work and my thoughts are brought into the perspective of peace and a harmony with most of the people I work with. I will take part in keeping this wonderful young man alive in his music.